Based on deep engineering and manufacturing competence, Alfa Laval Olmi air cooled heat exchangers offer the most reliable solution for avoiding production interruptions. 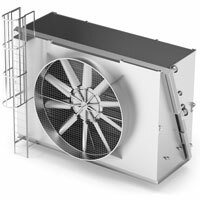 The range is suitable for demanding conditions, complex installations and critical applications. By investing in the right product from the start, Alfa Laval Olmi air cooled heat exchangers can lower life-cycle costs and reduce power consumption. Alfa Laval finned coil air cooled heat exchangers are suitable in auxiliary utility applications where the focus lies on finding a solution within a tight budget. 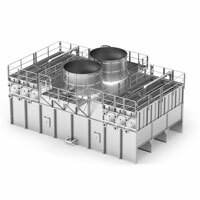 The coolers are delivered preassembled to reduce installation time on-site. The units have lower weight compared to traditional solutions and open up new possibilities for placement. Alfa Laval finned coil air cooled heat exchangers can help to optimize energy consumption and are superb in situations where water supply is limited, and dry cooling is the way forward. Alfa Laval ACE air cooled heat exchangers are robust coolers that have been designed with a harsh environment in mind. Quick and reliable response times combined with accountable technical support provide the basis for ensuring a competitively priced product, designed and delivered on time. The finned tube technology used enables these air cooled heat exchangers to reach high temperatures and pressures when necessary. Alfa Laval Niagara wet surface air cooler presents a water conservative and maintenance friendly solution for superior cooling. Lower outlet temperatures are achieved thanks to a technology of flooded spraying on bare tubes. The process medium can be cooled directly since it is a closed loop system, and thereby a single approach to the wet bulb thermometer is achieved.